This adorable wallpaper was meant for a child’s room, and came to the museum within a collection of samples by German manufacturer Marburger Tapetenfabrik. In creating this pattern the designer successfully manipulated a faddish aesthetic into something that remains pleasing and relevant well beyond its manufacture date. Little birds are represented by blocks of color shaped like teardrops, lemons and chili peppers. Lavender, pink and green are used alongside the primary colors of red, yellow and blue. Triangles become beaks, and simple thin lines are eyes, wings and feet. The artist has given each chick a unique expression, and every one is a delight to study as an individual character. There is no shading or use of perspective, but this doesn’t seem to bother the colorful brood as they eat up the black speckles that act as food in their two-dimensional universe. 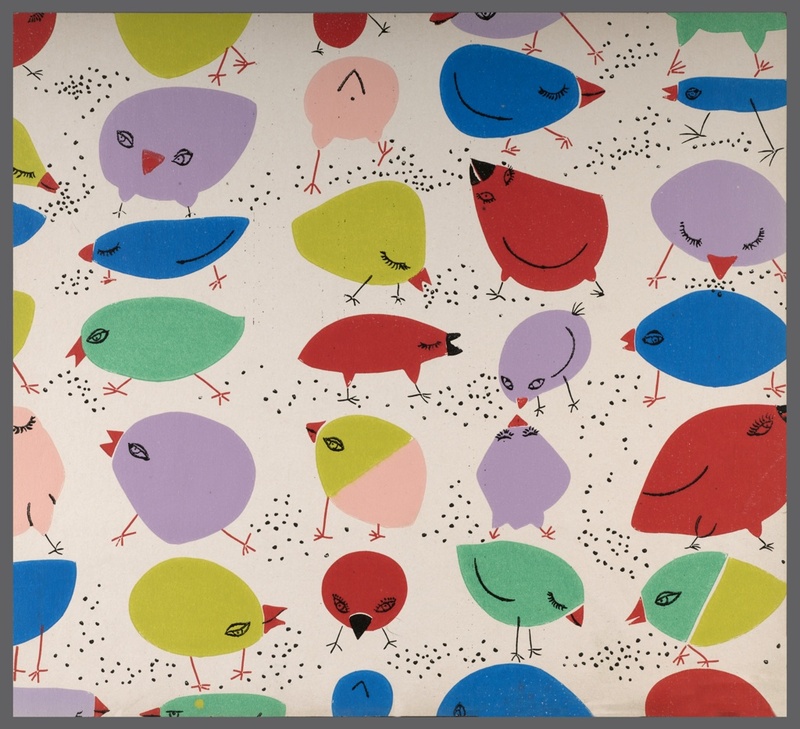 While many other children’s papers of this era show cartoons, toys, and other motifs that might be a bit too juvenile for grown-ups to fully appreciate, this pattern is a good mix of fun and sophistication. The first iteration of Marburger Tapetenfabrik appeared in 1845, when Johann Bertram Schaefer opened a store specializing in goods for interior decoration in Marburg, Germany. By 1879 Schaefer’s company was producing their own wallpapers. After WWII Marburger moved their headquarters to the town of Kirchain, and started producing lots of patterns that, like this one, were in the “contemporary” taste. By choosing wallpapers and other design elements that were a clear break from pre-war styles, consumers could make their living spaces reflect an optimistic future instead of a bleak past.